What a pleasure to learn that tasting Shabbos foods on erev Shabbos is actually a mitzvah! In his new book, More Shabbos in My Soul, Rabbi Boruch Leff once again turns the ordinary into extraordinary by reminding us how to infuse passion into our weekly preparations and observance of Shabbos. 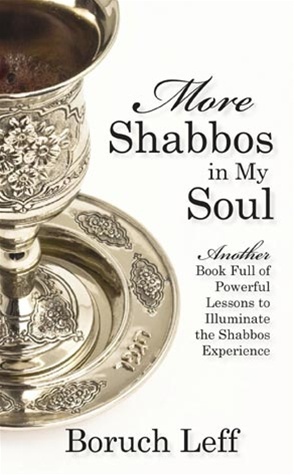 From preparing the home and family in honor of Shabbos, to the tremendous benefits of invigorating Shabbos through Torah learning and true oneg Shabos, Rabbi Leff clearly illustrates the difference between simply observing Shabbos and truly living it. His lucid and entertaining writing style makes it a pleasure to learn how to empower ourselves each week via this holy day.